The Astronomical Observatory of Belgrade purchased one 60cm Cassegrain telescope from Astrooptic company in Austria (which in the meanwhile became part of the Astro System Austria - a much bigger company in Austria for manufacturing telescopes) in 2005. It was finally installed and rectified in Jun 2011 and began to work in the same month. Figure below shows the geometrical draft of the ASV site. The small observing paviliov, where the 60cm telescope is installed, is designated as ASV1 on the figure. Its exact latitute, longitude and altitude (measured by GPS) are: lat: 43o 08' 24.6", lon: 21o 33' 20.4", alt: 1150m above the sea level The pavilion is shown on the picture below. The primary and secondary mirrors of the telescope are from LOMO in St. Petrsburg, Russia. The primary mirror is parabolic and 60cm in diameter. Its focal ratio is f/3 but the primary focus is not in use. The mirror is coated with AlSiO2. The hiperbolic secondary mirror is 20cm in diameter making 33% obscuration in the field of view of the telescope. It is also coated with AlSiO2. The telescope system is f/10 with Cassegrain focus of 6000mm. Focal reducer, with 4 lenses organised in 3 groups, reduce the telescope to f/5. The telescope's mount is German equatorial (GEQ). It was installed in September 2010, but the final Polar alignment and the mirror collimation was done in June 2010. To compensate the main slewing errors, such as Polar alignment, collimation, and mount errorors, the pointing model was made with around 10 stars. Figure below shows the telescope. The telescope is controlled via "Autoslew" written by Phillipp Keller. Alternatively, the telescope can be controlled using TheSky6 planetary software or MaximDL CCD imaging software. Visual Basic and Java scripting via ActiveX is possible. Remotely, the telescope can be driven through ACL-protocol. Currently (December 2011), we develope scripts which automatize the observational projects performed with the 60cm telescope. The figure below is a snapshot of the "Autoslew" main window (the figure is taken from the "Autoslew" manual and the red numbers are just marks and should not confuse). We provided several CCD cameras for various observational programs. The Apogee Alta U42 camera is highly supeior by some characteristics that are required for most of the projects and it is in mostly used. Figure below shows the fild of view (FOV) of this CCD camera attached on the f/10 60cm telescope relative to Orion nebulae (focal reducer doubles the FOV of the telescope). The whole image is 87' x 116' as marked on the figure.. The pointing error of the telescope was measured in three occasions: on 21st August, 2011, 10th September, 2011 and on 16th September, 2011. In all cases, we have chosen about 10 stars, randomly distributed on the sky, and slewed the telescope. We measured the difference between two successive pointings and took the standard deviation of all differences as a measure of the pointing error. Figure below shows the result of the test. At the time of the testing, there was a minor problem with the alignment of the RA encoder, so the data are designated with numbers for easier identifcation of the outlier pointings. Different colors correspond to different time periods of the testing as shown in the legend. The RA pointing errors for 21st August, 10th September, and 16th September are 226.6, 190.3, and 129.7 arcsecs, respectivelly. 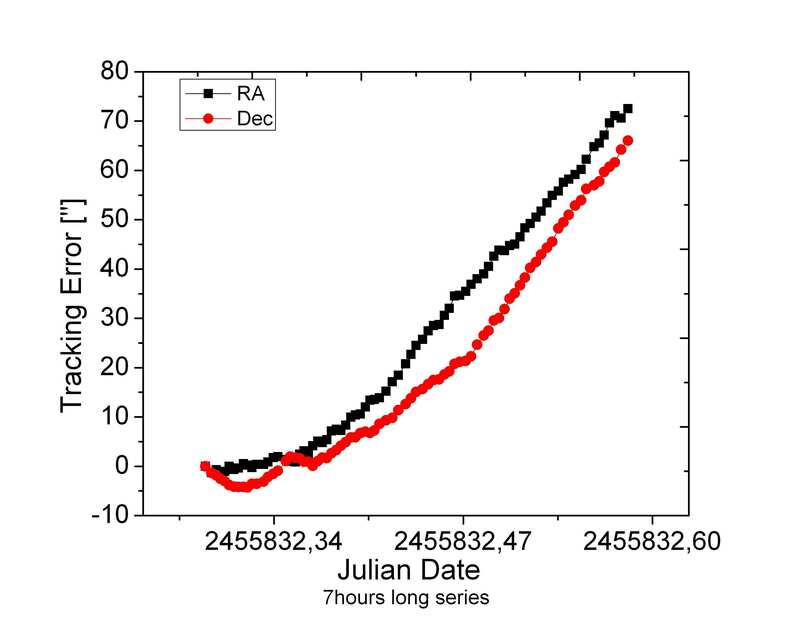 The Dec pointing errors, ordered by date in the same way as for RA, are 44.4, 56.3, and 66.9 arcsecs. As can be noticed, the pointing error for both coordinates is quite large. This is especially true for the RA, reflecting the above mentioned problem with the encoder. We assume that a strong earthquake, which happened just before the testing, could displace the telescope and, that the pointing model does not compensate the slewing errors any more. For testing the tracking performance of the telescope, we carried out a series of continuous measurements taking images of the same object for 6 minutes, 20 minutes and 7 hours. The results are shown on the figure below. Tracking errors in the Dec and RA directions are designated with red and black dots, respectively. 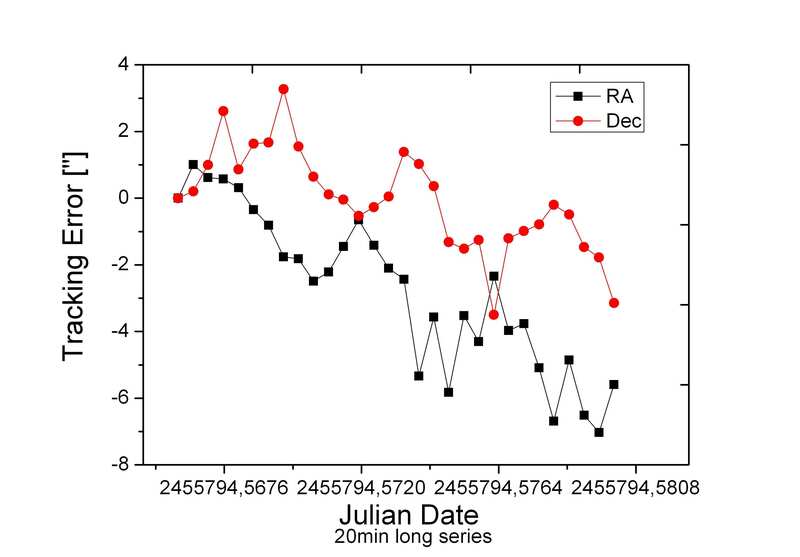 The X axis is time in Julian Dates. The Y axis is the difference in the star's position on the CCD frames relative to the first one. Knowing the pixel scale, the differences measured in pixels are converted into arcseconds; pixel scale of the CCD camera used for the tests is 0.46"/pix taking that the telescope's effective focal length is 6000 mm. 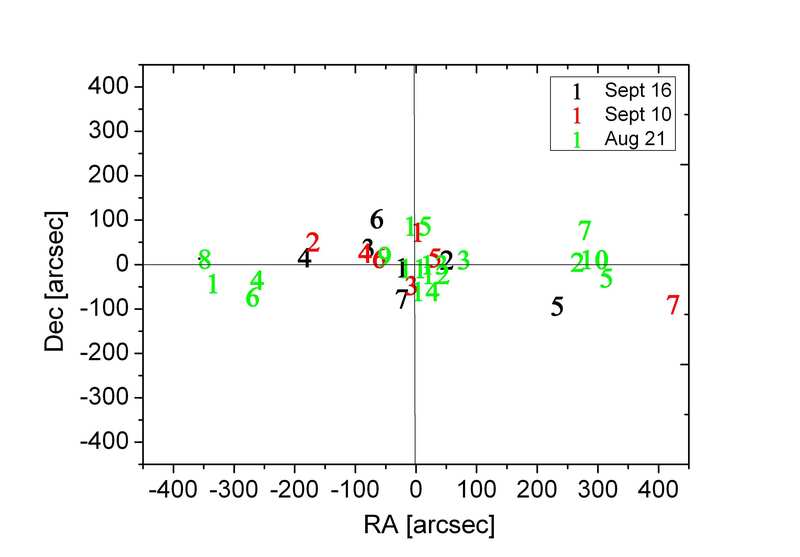 As it can be seen from the figures, the tracking is quite stable on small time scales (below 2 arcsec for Dec and around 3 arcsec for RA for 6 minute tracking). 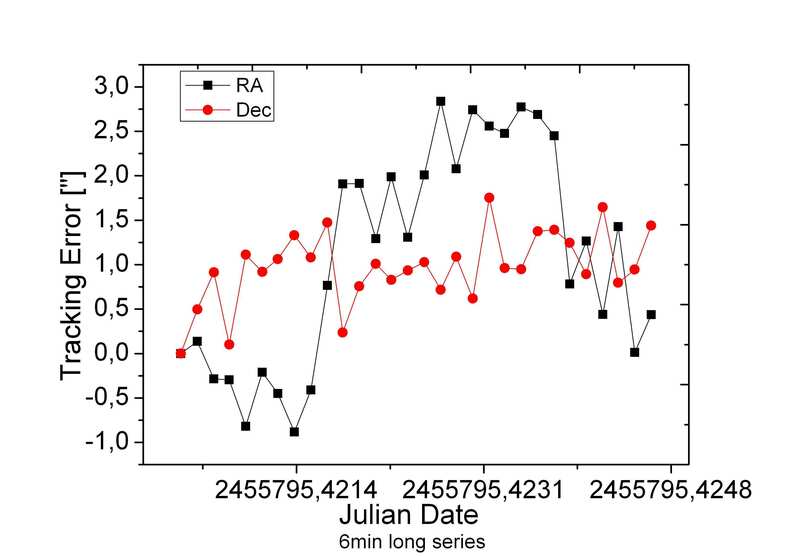 However, there is an increasing/decreasing trend of the tracking error on longer time scales indicating again that the pointing model does not compensate the main slewing errors of the telescope so effciently. As already mentioned, the telescope is driven by "Autoslew" Windows software. ASCOM platform and ActiveX enable to connect this software with several others and makes possible the complete automatization of the wanted observations. We use MaxIm DL 4 imaging software and TheSky6 planetary software in conjuction with Autoslew to do the automatization. Through MaxIm DL we drive only the CCD camera and filter wheel, while TheSky6 is used to "inteligently" chose the objects from the list of the objest to be observed. As an example, below is a VBScript which connects the CCD camera.